It has been over 100 years since the Titanic sunk, killing more than half its passengers and crews on board. 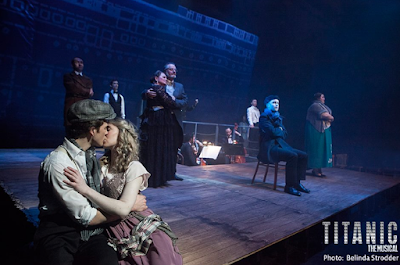 While this famous tragedy is a well-documented and discussed event, Stage Art's production of the Australian premiere of Titanic: The Musical breathes new life into the story, creating a gloriously entertaining show that should not be missed. Some of the stand out performances included Jon Sebastian as the pompous J. Bruce Ismay, Casey Withoos as the second-class passenger with aspirations of first-class grandeur Alice Beane, Sam Bennett as love-struck third-class passenger Jim Farrell, and Dom Winsor, reprising the role he first played over a decade ago in the US production, as the ship's designer Thomas Andrews. Peter Stone's story and book develops elegantly and organically: even with such a large number of characters, every single person has a clear and distinctive story arc or motivation. Whether it be through a song or a short scene to tell their story, they all felt fleshed out, whereupon the emotions felt and reactions experienced with the sinking of the ship are rendered even more heartbreaking to witness. The characters in Titanic: The Musical were based on actually on board the ship, and while a little creative licensing occurs, Stone's careful research is evident and pays off marvelously. The music and lyrics by Maury Yeston are wonderfully brought to life by the highly talented band and singers under the proficient musical direction of Kent Ross. The ensemble pieces, especially the epic opening number, are a dream to listen to and you cannot take your eyes of the accompanying action happening on stage. Greta Sherriff and Matthew Hyde perfectly complement each other with their voices and their song "I Give You My Hand" is a tender and touching moment. Adam Di Martino and James Brown's dynamic ragtime number "Doing the Latest Rag" is also a firm favourite. Titanic: The Musical is a gripping and entertaining story that reaches far beyond the familiar historical narrative we though we knew. Already halfway through 2016, it is fair to say that this will emphatically be one of the best musicals, if not one of the best shows, of the year. *Review first appeared on Theatre Press on 1o July. Thank you for your terrific review of Stage Art's masterpiece staging. I could not stay away and ending up seeing Titanic three times in total. Fingers crossed that they will consider a return season, too. Thanks aussieskates! Life and a weekend in Sydney meant I couldn't go back and see it so would be totally keen for a return season too!